In the history of our exploration of alcohol together, Duc and I have always found that whiskey was a constant that we enjoyed neat, on the rocks, and mixed into classic cocktails. Old Fashioneds are my go-tos when I visit a new bar. We won't pass up on checking out places boasting whiskey collections. 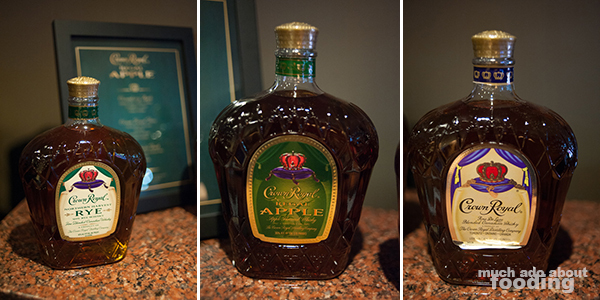 It only seemed appropriate to at least explore variations so I hopped onto the opportunity to attend a Crown Royal tasting featuring their Regal Apple flavored whiskey released in November 2014. The evening was hosted by Stephen Wilson, Master of Whiskey for Diageo, and Gerry Graham who went into the history of Crown Royal's beginnings in 1939 as a gift blend for King George VI and Queen Elizabeth during their tour of Canada. We quickly went into a tasting of several Crown Royal blends after. 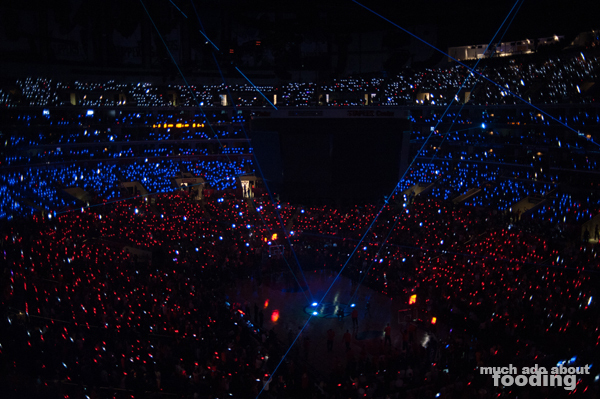 "When you start with something this special, the possibilities are endless." 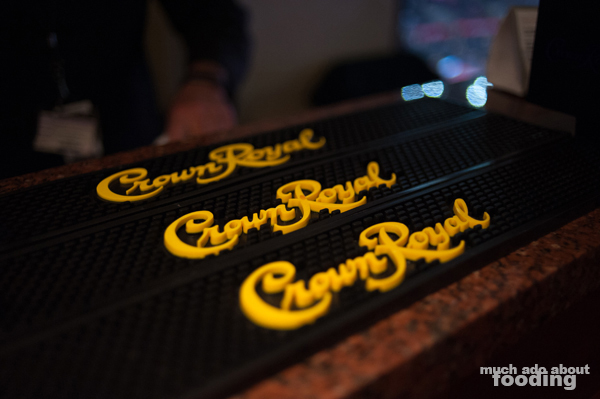 The original blend was a combination of 50 individual whiskeys according to Crown Royal's history. Produced solely at Gimli at their distillery in Lake Winnipeg, the whiskeys of Crown Royal stayed in Canada for nearly 30 years before it was finally distributed outside of the country. If you're wondering if you've seen their bottles on the shelf before, you likely have noticed their unique "packaging" which is individually contained in colored felt bags with embroidery. The different whiskeys that they produce can be divided up into five bases - two corn, one Bourbon-style, one rye, and one "coffee" rye. We started off the evening drinking with a tasting of three types with some direction from Wilson on how to engage all of our senses with focus on stimulating retronasal olfaction. Take a small sip and hold it in the center of your mouth. Move your head side to side, coating each cheek in liquid, and then push it to the tip of your tongue. Pull the liquid to the roof of your mouth before swallowing. Open your mouth, breathe in across the tongue, close your mouth, and finally breathe out through your nose. We began with their namesake Crown Royal which came through with some creamy oak notes, vanilla, and spice. I could see this being an easy-going whiskey. Then we tried the Northern Harvest Rye which was recently named "World Whisky of the Year" through Jim Murray's "Whisky Bible" for 2016. Both were interesting peeks into the world of Canadian whiskey and what could be done there. It was certainly softer than the typical American rye we've had before with characteristics of baking spices in it. Their version is a 95% rye blend with some Bourbon styling and a smidgen of corn whiskey to round it off. Lastly, we had the Regal Apple which we were all there for - Wilson explained that its natural apple flavor comes from Gala apples (plenty of them!) and has been well-received by non-experienced and experienced whiskey drinkers alike. The nose heavily weighed of that candy green apple smell but it wasn't cloyingly sweet upon sip. In fact, it was quite smooth and just a tad too easily drinkable. No wonder anyone would have some - it's dangerously palatable to many audiences. Mixed into cocktails would make the Regal Apple an easy hit no matter the occasion but even on its own, the smoothness was enticing. Bravo for latching onto something that touches a variety of drinker types! 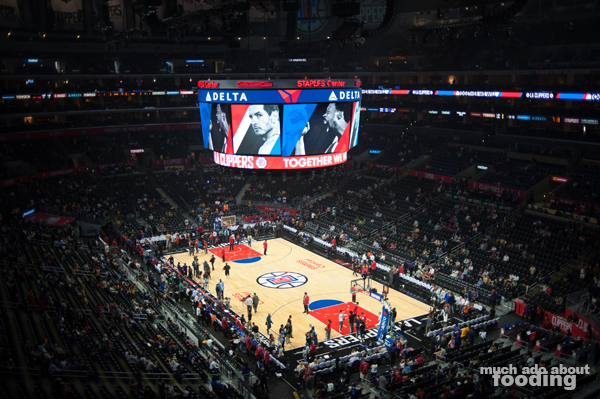 But of course, I have to end the post with obligatory shots of where the tasting took place - in a suite at the Staples Center for the Clippers vs. Lakers game. 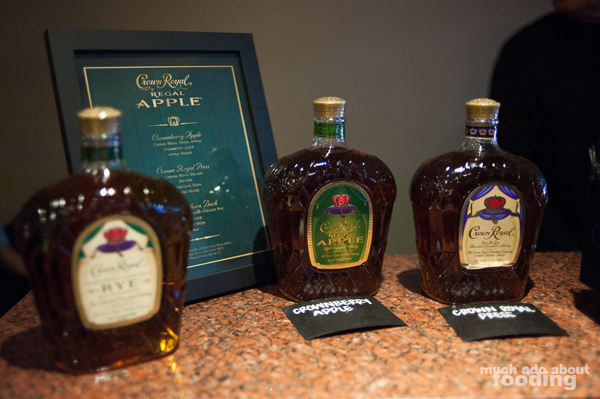 My thanks to Crown Royal for hosting!